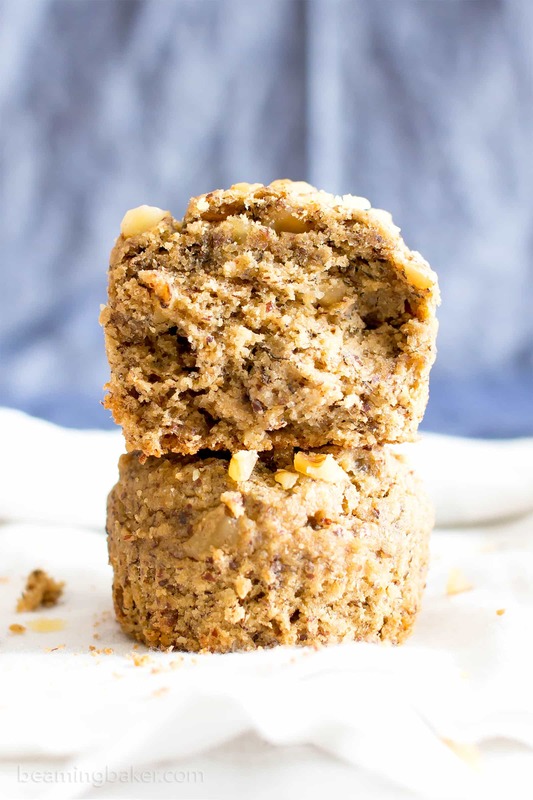 One Bowl Gluten Free Vegan Banana Nut Muffins (V, GF): an easy, whole recipe for deliciously soft and moist banana nut muffins. Vegan, Gluten Free, Whole Grain, Dairy-Free, Refined Sugar-Free. And then think to yourself, “I’m weird for talking to myself this much… But I’m still doing it. Like, right now.” And then turn to your friend, Beaming Baker, and feel totally okay since she does it all the time. Um, anyway… As I was saying (not to myself), did you even ripen bananas in hopes that a delicious, home-baked goodness banana-rrific recipe would be shared on BB? Or… did you grab those ripe bananas and pop them in the freezer, then eagerly make this ice cream, this ice cream, or these popsicles? Either way, baking season is BACK. Like, grab your favorite cozy oven mitts (hopefully with the exact floral pattern that reminds you lovingly of Grams), the whisk that can actually withstand the strength and sturdy fortitude that is cookie dough, and the cutest cupcake liners you’ve ever seen… and get ready to get your bake on! 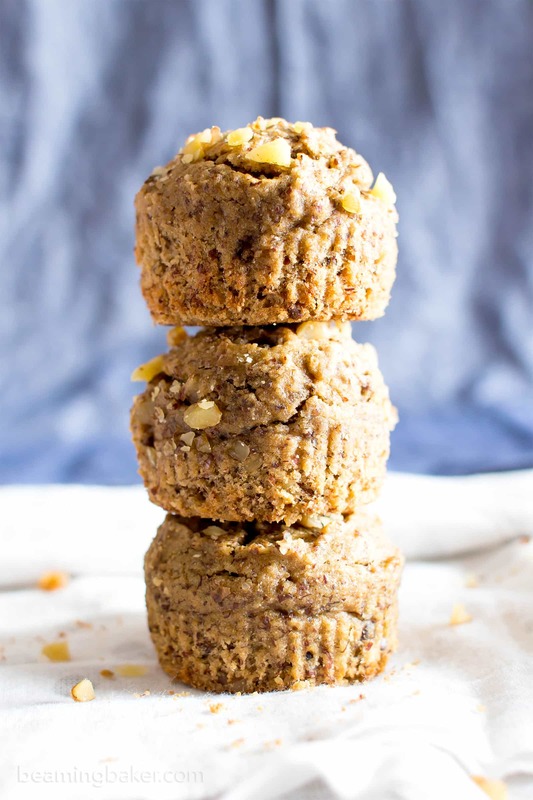 To kick off this lovely season, we’re gonna start with these One Bowl Gluten Free Vegan Banana Nut Muffins. They’re based off one of my favorite recipes of all time, my One Bowl Vegan Gluten Free Banana Nut Bread. Have you ever tried that recipe? It’s one that I get emails, Instagram shoutouts/stories (btw, have you tried this new-fangled feature yet?? ), and Facebook comments about all the time. It’s one of my favorite recipes to bake, and shocker… eat! 😉 The texture, the taste, the scent while making & baking… all of it just makes me happy. If you’re a big fan of banana, or even don’t really care about bananas, you’ll still adore this. Well, I’ve gotten tons of requests about changing that delicious loaf into a muffin recipe. So here we go! This time around, I reduced the amount of bananas by just a bit—2 tablespoons. For the banana bread, I really, really wanted the bread to have the perfect texture—light, but also deliciously dense, nutty and satisfying. But more importantly, I wanted it to slice beautifully. 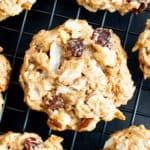 No crumbly, hot mess for us! 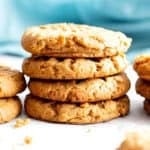 So that one required a longer baketime, longer cooling session—meaning they needed more moisture in the initial batter to keep everything well-balanced. Et voila: clean slices and moist bread! 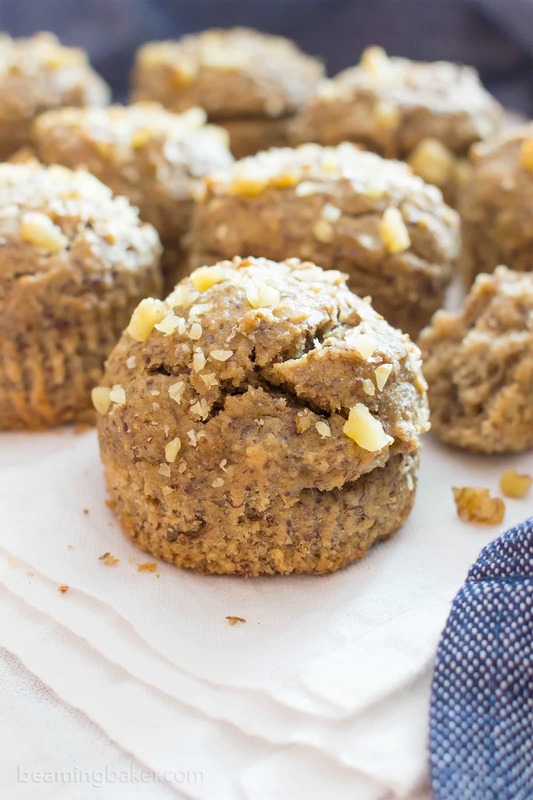 For these one bowl gluten free vegan banana nut muffins, there’s absolutely no slicing involved. Because: muffins. Ahem. 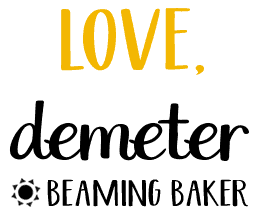 Also, they’re baked in much smaller increments than, say, a giant loaf… As such, the bake time, cool time, etc. are much lower. To account for that, I reduced the amount of banana. Also, does it bug you like crazy when recipes just say “3 bananas” instead of exactly how many cups of mashed banana? That used to drive me cray back in the day when I didn’t have my own blog. So I made sure to include the exact measurement I use every time. As for those beautiful domed tops you see in the photos? Firstly, the batter is the cat’s meow guys. It stays in place, does not droop, and pretty much keeps the shape you give it before going in the oven. So what I do is I use my trusty, my favorite… Ice Cream Scoop. Okay, who didn’t see that coming? 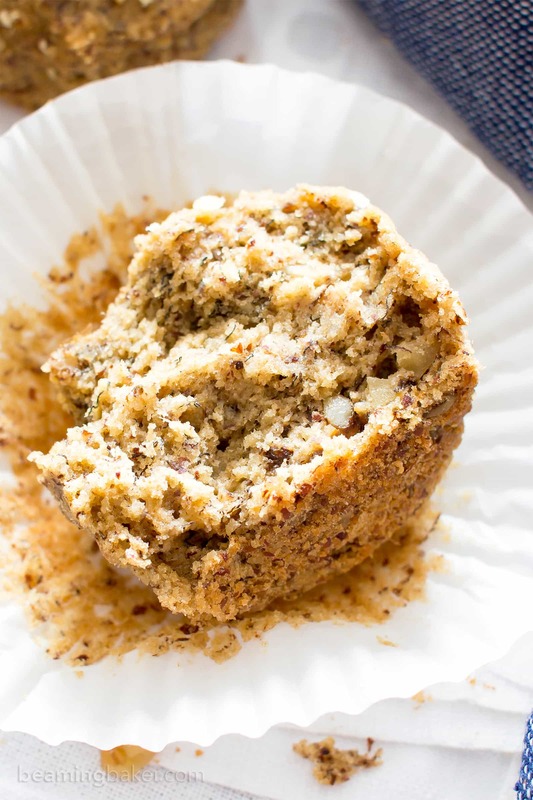 I scoop out just over a ¼ cup of muffin batter and drop it right into the liner. It seriously gives my muffins the most beautiful dome top. What Fall and Winter recipes are you hoping to see in the next few months? Preheat the oven to 350°F. Line a 12-cup muffin pan with muffin liners. Add peeled bananas to a large mixing bowl. Using a sturdy whisk or fork, mash bananas until smooth. Add the coconut oil, coconut sugar, flax egg, and vanilla. Whisk until well incorporated. Add oat flour, almond meal, baking powder, baking soda and salt. Whisk together until just incorporated, making sure no flour patches remain. Fold in walnuts. Using a large scoop, scoop and drop batter evenly into muffin cups. I use this ice cream scoop for easy scooping and a beautiful round top. If needed, smooth batter into an even layer, with a domed top (rise) in the center. Optional: sprinkle walnuts on top of the muffins. Bake for 16-22 minutes. Mine took 19 minutes. Allow to cool on a cooling rack for about 1 hour. Lift out and enjoy! - Adapted from my Double Chocolate Banana Muffins and my One Bowl Gluten Free Vegan Banana Nut Bread. - *I like to use this ice cream scoop to scoop and drop one scoop into one cup. This scoop helps control the batter, prevent messes and gives you a nice rounded top. Tip: after dropping scoops, lightly tap the pan to even out the batter. - Freezing instructions: These muffins freeze well. Store in an airtight, freezer-friendly container for up to 1-2 months. Allow to thaw at room temperature for 15 minutes before enjoying. Or, heat in 20-second increments in the microwave until warm. 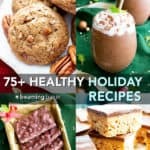 - More muffins + quick bread recipes: chocolate chip pumpkin muffins, gluten free banana oat muffins, chocolate banana nut bread. Here are a few items I used in today’s recipe. 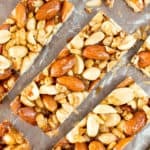 I love all of your recipes but my daughter is allergic to nuts (and eggs and dairy!). 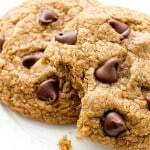 I try to keep the flour, if I was to substitute the oat flour and the almond meal for all purpose flour do you think that would work? How much do you think I should use? 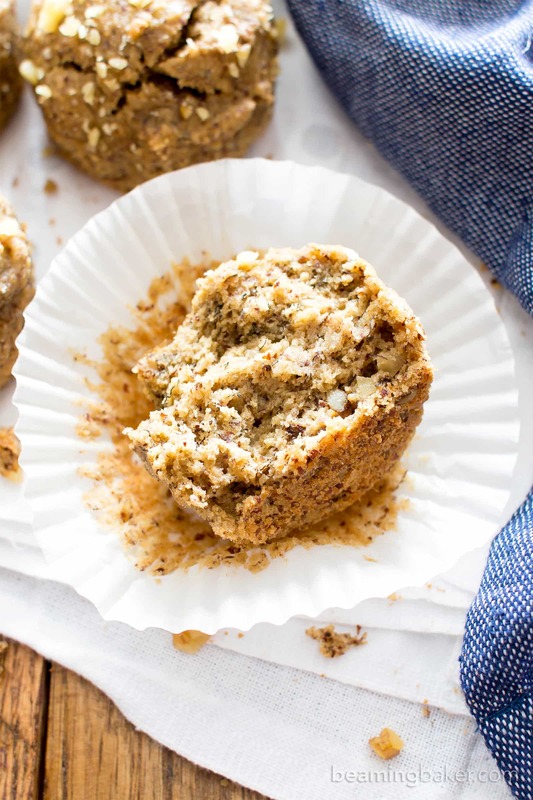 Love that these muffins come together in one bowl – such an easy way to begin the day! Right!! It doesn’t get easier than that! 😉 Thanks Melanie. You say these are allergen free, but I have to tell you, they’re not. I get so angry when I go down the gf aisle and something says in big, bold letters GLUTEN FREE, and then the first thing I see is oats. Oats DNA are almost identical to any kind of gluten that anyone who truly allergic to gluten, not just wheat, will still be allergic to them. Everyone in my family with the allergy is and everyone I’ve spoken to is. Is there anyway you could experiment and find a banana bread or muffin recipe without the oats because, honestly I love my mom’s cooking and I love her so I can’t tell her this, but I just can’t stand her banana bread. I don’t know what it is. Would you suggest maybe almond flour instead, or something? Because when we use or normal rice flour with carrot or banana, it’s just not right. She’s been allergic for 45 years and I’ve just gone allergic for some reason. In the last decade, I’ve been somewhat sensitive, but now I’m full on allergic. And carrot cake is my favorite with a cream cheese frosting. But, no matter how much carrots you put in, it’s bland. And with banana, it starts off that way, but then if you add too much it gets smooshy and tastes like rotten bananas. And, trust me, I can’t do any better, even though normally I’m the baker in the family. It’s like we’ve just hit a block. Do you have any suggestions at all? what about quinoa flour? I baked few things with it, even a banana bread once since I had run out of oats and I loved it! Is it possible to replace the coconut oil with applesauce to make this oil-free? Try replacing it with equal amounts of aquafaba (1/4 cup). Loved this recipe! We had company spending the night and I wanted something for breakfast that would be easy. They loved these! Couldn’t have been any easier! 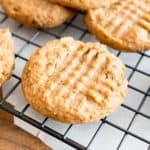 And not a bit gummy like some gf muffin recipes I’ve tried. Excellent flavor and texture. Highly recommend! Hi Diana, it’s so wonderful to hear your feedback! 🙂 I’m so pleased that you and your guest enjoyed these. 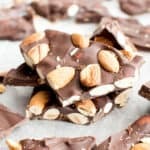 I aim to make the least gummy (okay, not gummy at all haha) recipes! Thank you for taking the time to let me know how they turned out. Enjoy! I love all your muffin recipes! I’ve made a bunch and my family has loved them all. 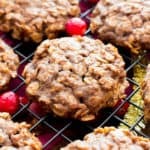 Yours is my go-to baking site because you use oat flour and almond meal, and everything always turned out great. Thank you so much for sharing your awesome recipes! 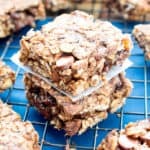 I love anything banana, so these are the perfect breakfast/dessert/treat! I didn’t have almond flour, so I substituted it with coconut flour and they turned out well. Next time I’ll probably add some dairy free milk or more oil since they were a bit dry. Also, I added cinnamon and used a blender for a smoother consistency. Overall great recipe! Banana breakfasts are the BEST!! 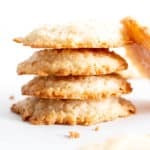 Oh yes, if you use coconut flour it will absorb way more of the wet ingredients than intended–it’s much, much more absorbent than almond flour. Glad you enjoyed them! It doesn’t seem fair to rate the recipe when an ingredient has been replaced; would love to see the comment without the rating.